Many longtime owners of low-grade alloy wheels notice on occasion that the chrome plating on their wheels has started to scratch and flake or simply look less than pristine. Luckily the chrome plating on alloy wheels can be removed fairly effortlessly. You should only try to remove the chrome plating on your alloy wheels if it is already peeling or flaking and you’re not concerned with permanently altering the look of your wheels. The entire process of remove the chrome plating is a bit lengthy but if you have some extra free time then you can have your wheels looking brand new after a few simple steps. 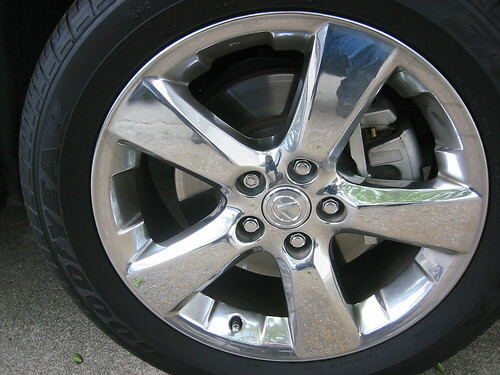 The obvious first step is to remove the chrome wheels from your car (either one at a time or all four at once) with a lug wrench or tire iron. At this point just follow along as though you were changing a tire. Next remove the wheel from the tire with a standard pry bar, which can be found in any general auto parts store. Afterwards, spray a generous amount of wheel polish over the wheel surface and allow it to sit for approximately five minutes. Grab some medium-grit sandpaper and sand the surface of the wheel until most of the chrome plating is barely visible. Then polish the wheel again with the wheel polisher and let it set like before for about five minutes. After you’ve the wheel polish sit then go back over the wheel with 1200 grit sand paper, and then coat the wheel again with polish. After the most recent coating of polish has set for five minutes then sands the wheel with a steel wool until the chrome plating is completely gone. Finally, rinse the wheels with water to get rid of any chrome particles left from the sanding and polish the wheel with a soft cloth. There are some other methods that work for some people too like an acid dip and electrolysis, but it can be very dangerous and leaves people with hazardous waste and is illegal to use on stainless steel. Though you can always just take your wheels to a chrome shop or purchase an ultrasonic cleaner or sandblaster to remove the chrome plating in a matter of minutes. Or there is always the really simple method of buying a whole new set of wheels. Many of the problem with peeling or flaking chrome plating can be solved by just buying a good quality set of wheels initially.